The village of Juvincourt and the hamlet of Damary together form the commune of Juvincourt-et-Damary. 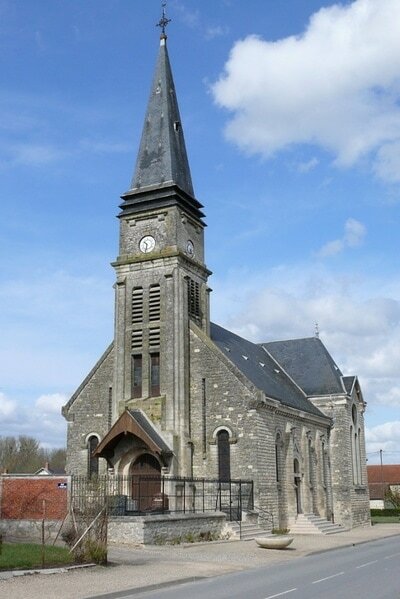 The village, in which the church and churchyard are situated, is 15 miles (24 kilometres) south-east of Laon. It lies 2.5 miles off the main road (N. 44) from Laon to Reims, which is about the same distance from Juvincourt as is Laon. There is a bus service along this road between the two towns, both of which have good road and rail communications with Paris and the towns of northern France. In the churchyard, about ten yards north-east of the central memorial, is the grave of an airman of the Royal Canadian Air Force. J/87645 Pilot Officer David Neville Cotton, Air Gunner in 427 Squadron, Royal Canadian Air Force, died 29th June 1944, aged 22. Son of Sydney Charles and Ada Cotton, of Esquimalt, British Columbia, Canada.